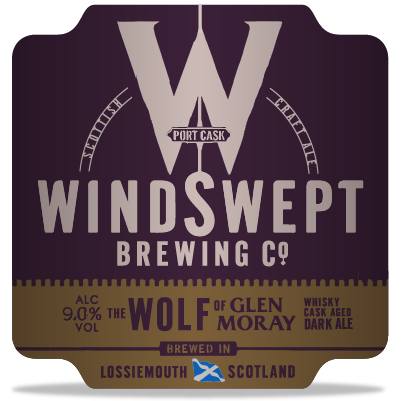 Aged in a port cask used by Glen Moray to create their Port Cask Finish Whisky, the Wolf has matured with plump summer fruits on the nose, fruit flavours through the dark chocolate malt and a refined warm finish. Glen Moray’s Port Cask Finish Whisky is finished for 8 months in port pipes from Porto Cruz, the number one Porto company in the world. A pipe is a large long barrel with tapered ends. Sizes vary quite a bit but the average pipe of port is 550 litres. We age the Wolf in the freshly emptied pipe for up to five months to get those whisky notes and the delicious dark berry, plummy flavours from the port.